At the time of this being written, I am twenty-seven years old. I still sleep with a teddy bear, as a matter of fact, he’s leaned up beside me as I type. I’ve had my stuffed buddy from the age of two, when we started the web comic, I knew that I wanted to include him in one. This was possibly my favorite comic from the series, as it is by far the most personal. 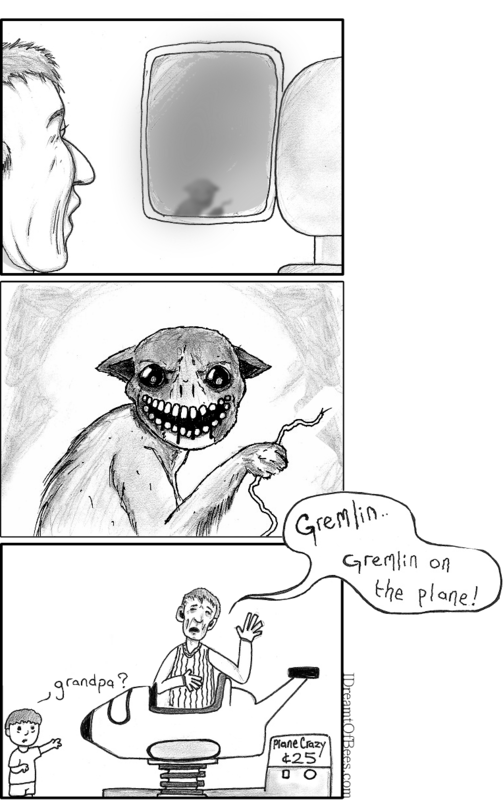 If I ever start the web comic back up, I will definitely be doing this one again, it still makes me smile. I really wish I could find the final draft of this comic, I must have redone it five times at least. My ability to draw anatomy at the time was god awful, but I still get a kick from the final frame. This one is interesting, I was extremely unhappy with my artistic ability at the time, and this comic was really good to help push my ability forward. This may be the first time I ever used a reference photo to draw a figure ( I was beyond stubborn with art, and refused to take certain steps until I was in my twenties) I took photos of myself for the first and last frame of this comic. The end image was drawn using a photograph of myself in a housecoat, I couldn’t grow anything that resembled facial hair at the time, so the beard suffered as a result. Believe it or not, that stupid frame took me a good hour or two to draw, and I didn’t get it right until about fifteen or twenty attempts. The final comic had a slightly more polished first and second frame, but the end product still held a rather inconsistent feel, as I had to rush out the final product to meet that weeks deadline. This one could use a major update regarding the art quality, but I still think this one is funny as hell. This is the best representation of what a completed comic looked like on the website, honestly, if I were to redo this one today, it would probably look quite similar. I always wanted my comics to be simple, and clean looking. I still think I find too much humor in this one…I don’t recall it being very popular. I think this could have been done better. 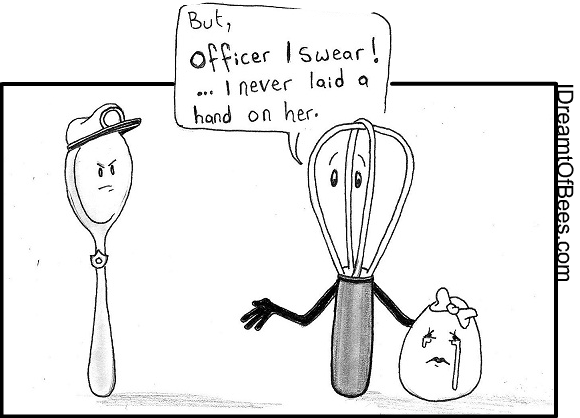 An electric eggbeater, opposed to a whisk, would have been a much higher return comic. Damn. Josh really had me beat in terms of artistic ability at the time….and still has me beat. Regardless, I found myself having to explain this one to a fair amount of people, but those who got it without explanation seemed to get a real kick out of it. It was his first addition to the web comic. Another one of Josh’s entries, I’m fairly certain I came up with the idea for this one, although there is a good chance that is just wishful thinking, as Josh is a far more comedic person than myself. I cannot recall if the final version was full color or not, but I still love this comic. This comic was based off a conversation I had with my friend Julian, we were discussing the coolest way to dine and dash. Just to clarify, there is nothing more cool than paying after you eat…but flying off a rooftop restaurant is a close second. credit for the gag goes to Jules for this one. I think my top idea was going to a restaurant by the water with an oxygen tank in your back pack and saying “Sea you later!” as you jumped out a window, and swam away. I still think it gets a ton of style points, but doesn’t translate to comic format nearly as well.